Wondering what is being compared in this book :comp: - This Forum is brought to you by The Mastiff Sweet Spot and Friends of the Forum. Your entire premise, is based on someone not knowing his music was affecting you, since he was 1/4 mile away. What if he was in the next room and intentionally raised the decibel level to create a new trend in sound! What if he mentioned you to his friends and clearly stated that it was your hearing that was faulty and that the volume was just fine for those with healthier hearing. What if he and his friends continued to spread the loud music, that drowns out other forms of music, and due to a local ordinance, makes it perfectly legal? Well, you could change your location and that would solve your issue! Or, you could try to gather support from other people with normal hearing such as yours and try to gain some momentum for him to change his ways! In the old West, when somebody stole your cattle and then placed their brand on them to conceal your brand, it was called rustling......A hanging offense! You trend on reducing any controversy in this matter and by your questions, it reflects my belief, that you feel there are no consequences to the Mastiff community by legitimizing the cross and it's name. I was seeking not to reduce any controversy, but rather to interrupt, and to find other, more productive solutions to, what has become an ' escalating spiral of conflict'. In my experience, as I have said,such spirals seldom end well and generally cause quite a lot of collateral damage for all involved. My questions were a very genuine attempt to put all of the pieces of the puzzle (such as they exist) together and form a more developed picture of what has happened; what has been tried; what has not been tried. I also provided some strategies, tactics and potentially actionable targets that I believed might be effective in at least forcing a strong distinction to be made between AMMAs and the Mastiff. I do not believe anything can be done legally about the name "American Mastiff' as -- whatever reasons/beliefs existed that led to MCOA inaction -- the name was taken. I don't quite understand the sentiment that it was usurped, because it was not being utilised for our mastiffs. (i) Confusing the potential Mastiff buyer & public perception. (ii) Depleting revenues of Mastiff breeders. (iii) Increased rescues, euthanasia & negative press. There are no data, or quantifiable assessments here. The reason I am pushing on this is that a year or so ago, you made comment in a thread saying that (paraphrasing) there were thousands of registered mastiffs in the country, and the number of AMMAs is miniscule. Now perhaps the AMMA population has burgeoned since then ??? I am also unclear what you mean by ' legitimiizing the cross and it's name' . I'll preface my remarks that I joined their forum to try to get a more complete picture of both sides of this conflict, and to understand the goals and intentions of the AMMA organisation. Is there a debate going on in the AMMA community about this? Not that I've read, other than to express bewilderment with the mastiff community. The original perspective I've seen is that the Mastiff organisation chose to continue calling its breed 'The Mastiff'. They (AMMA) believed that left the 'American Mastiff' name open and unclaimed. As I understand what they've said, it was felt the American Mastiff was more accurate than Anatolian Mastiff, because their foundation dogs were a comparatively small percentage of Anatolian antecedents compared to English Mastiff. They also saw/see themselves as filling a different niche -- producing 'pet only' family dogs. Are they just upset about our grievances and react with total indifference? Do they accept, or understand the validity of our arguments, or just consider us snobs? Or, do they just go about their business defying & ignoring any truths to the case we bring to the table? First, on their board (forums), they do not allow the 'bashing' of any breed, or verbiage that is considered hostile, offensive, insulting, attacking, inflammatory etc. Hence, their forum culture is quite different from our own. Unfortunately, when their forum members come here to discuss things, it quickly becomes what many have considered to be a hostile and emotional environment. If you look at the many threads in our archives (those that haven't been deleted), you can observe for yourself the usual tenor and progression of the debates. There are too many Karens on this thread. :) I don't think I'm being referenced but correct me if I'm wrong. If not and unless someone challenges something I've said, I've clarified my thoughts on everything about as well as I know how. I have no control over how other respond to them. I'd like to think that respectful discourse could address the issue but fear it's progressed beyond that ever happening. I just realised it was Steve who asked the questions, sorry! It gets a bit confusing with quotes and quotes within quotes...I'lll amend that! One other observation I would offer is that, out of almost 4,100 members, only 12 elected to participate to any extent in this topic -- and one of those was fearful of being booted off the forum for expressing her love for her AMMAs. I also provided some strategies, tactics and potentially actionable targets that I believed might be effective in at least forcing a strong distinction to be made between AMMAs and the Mastiff. I do not believe anything can be done legally about the name "American Mastiff' as -- whatever reasons/beliefs existed that led to MCOA inaction -- the name was taken. I don't quite understand the sentiment that it was usurped, because it was not being utilised for our mastiffs. Not being an active reference does not mean it can be usurped by others to use and capitalize on in it's meaning. Ol' Blue Eyes was Sinatra, Duke/ John Wayne, King/ Elvis, Chairman of the board/ Sinatra, Boss/ Bruce Springsteen,etc. Sure, anyone can use most of those references, but if used in the same industry, by an entertainer doing similar gigs as the original, it would be morally wrong. There are impersonators that use those handles, but they don't hide the fact that they are lesser copies of the original! Can you imagine if someone started singing Sinatra tunes and called himself a better version of the Chairman? He'd be buried next to Hoffa! I am also unclear what you mean by ' legitimiizing the cross and it's name' . The data can be compiled and you can ask any Mastiff breeder if they have not had to explain the differences between breeds to clueless inquisitors. Not that I've read, other than to express bewilderment with the mastiff community. The original perspective I've seen is that the Mastiff organisation chose to continue calling its breed 'The Mastiff'. They (AMMA) believed that left the 'American Mastiff' name open and unclaimed. As I understand what they've said, it was felt the American Mastiff was more accurate than Anatolian Mastiff, because their foundation dogs were a comparatively small percentage of Anatolian antecedents compared to English Mastiff. They also saw/see themselves as filling a different niche -- producing 'pet only' family dogs. When they formed the cross they could not be sanctioned for any reputable showing organization, therefore the sour grapes kicked in and the pet only rationalization was the obvious saving face response. Besides kicking the snobs who breed genuine Mastiffs for show. The clueless are always bewildered by their lack of basic information. If the majority of the crossed percentage was Mastiff in their cross, then where did the American portion of the name emerge? It was created in America? So was the Oldsmobile, which is also no longer actively used, should I start a car company and use the name? You think GM might turn a deaf ear? If the AMMA people first did some DD on the breed, perhaps they would have seen the reference to the American Mastiff Club. Perhaps they did see it and didn't give a damn. Or, they never did a search, or read a book on the breed (almost every good Mastiff book makes some reference to that early club), which tells me, that they were not qualified to even begin to create a better mouse trap! Anyone can breed two dogs! First, on their board (forums), they do not allow the 'bashing' of any breed, or verbiage that is considered hostile, offensive, insulting, attacking, inflammatory etc. Hence, their forum culture is quite different from our own. Unfortunately, when their forum members come here to discuss things, it quickly becomes what many have considered to be a hostile and emotional environment. If you look at the many threads in our archives (those that haven't been deleted), you can observe for yourself the usual tenor and progression of the debates. Passionate discussions create greater interest and involvement. When people are not afraid to speak out, more information gets aired. Controlled forums, with watchdogs as moderators, only serve to maintain the party-line. If someone steps out of turn, they are immediately reprimanded and warned. Freedom of speech is one reason why this forum grew so large! Those old enough to remember, can attest to the heat I took when I first joined this forum. Even out of hostility, good things can happen. At least they were allowed to voice their views! Passionate discussions create greater interest and involvement. I certainly concur that is your philosophy. In my experience, people who have boundaries as to how 'passionately' they are willing to express themselves, and prefer 'civil' discourse, tend to be driven away, AND to be fearful of speaking out. Particularly as what is 'passionate' to one person, may be perceived as 'emotional and attacking' to another. Additionally, in the case of this discussion, please see my post # 112. When people are not afraid to speak out, more information gets aired. Controlled forums, with watchdogs as moderators, only serve to maintain the party-line. If someone steps out of turn, they are immediately reprimanded and warned. First, I believe people on this forum ARE afraid to speak out on a number of issues -- or choose not to get involved because it is too much time-consuming hassle to defend their points of view -- which, I acknowledge, I probably contribute to,as well, although it is not my preference. If you are specifically referring to the AMMA forum, my experience has been that anything may be expressed which is not framed in terms which are hostile, inflammatory, etc, etc. Surely it is possible to freely express one's thoughts in other ways. I also belong to quite a number of hobby and professional forums who welcome discourse and disagreement versus 'serving to maintain the party line' -- but who expect debate to be respectful of the participants. The data can be compiled and you can ask any Mastiff breeder if they have not had to explain the differences between breeds to clueless inquisitors. Then why hasn't the data been compiled? I am not the person making the claims of negative consequences (suggestive of financial loss)/threats, etc., and I believe the burden of proof is on you. The necessity of explaining differences between breeds to 'clueless' inquisitors -- (by whom I would suspect you mean the potential dog buying customer?) -- is hardly a major negative consequence. I cheerfully explain what my dog is and is not every day. When they formed the cross they could not be sanctioned for any reputable showing organization, therefore the sour grapes kicked in and the pet only rationalization was the obvious saving face response. Besides kicking the snobs who breed genuine Mastiffs for show. What is your evidence for this contention? I have, thus far, not seen any 'kicking of the snobs who breed...for show". I however, arrived late on the scene, so perhaps there were some public statements to this effect that I missed ? The clueless are always bewildered by their lack of basic information. This appears to be a tautology. So was the Oldsmobile, which is also no longer actively used, should I start a car company and use the name? You think GM might turn a deaf ear?Etc etc. The difference is, again, that GM used and trademarked the name 'Oldsmobile'. The MCOA did not use, or protect the name "American Mastiff'. The American Masiff Breeders Council (AMBC) was formed in 2002 to help protect and manage the breeding and proliferation of the Flying W Farm American Mastiff. The concern was that unscrupulous people would trade on the excellent reputation of the breed that Fredricka Wagner had developed for their own purposes or greed. Beware of breeders who are crossing Mastiffs with more aggressive breeds such as Pit Bulls to create large aggressive dogs. These breeders sometimes advertise under the name of American Mastiff, but they are not the CKC (Continental Kennel Club) American Mastiff created by Fredricka Wagner. Also beware of the Mastiff breeds Carnaris and Filo Brasilerio which tend to be more aggressive in nature. Above, from one of the members on the breeders council. Let's not develop a breed that is created out of greed, oh no! Let's not do that!!! Beware of other breeds that might compete with this breed and call themselves American Mastiffs! Because they are not the original knockoff, they are crossed with aggressive breeds, not the submissive Anatolian like ours is crossed with! Beware! Beware! BTW, where is their data on those other breeds? If people are afraid to voice their views on a public forum, so be it. We can't present an atmosphere that is conducive for all & everyone. Some people are just fearful, that should not mean we should create artificial environments just for them. This is not group therapy! The burden of proof would be on me in a court of law and at that time, I would be fully prepared with all data needed to present my case. Suffice it to say, that I have had a multitude of people who have contacted me on this topic. Many of which are well known breeders. Most have added disclaimers to their web pages warning folks about the erroneous claims put out by the AMMA people. False advertising does set up a case for legal damages. Where is the data to support their erroneous claims? Why don't you ask them for that? Why is it the victims need to show how they've been victimized, even though it is obvious? What is your evidence for this contention? I have, thus far, not seen any 'kicking of the snobs who breed...for show". I however, arrived late on the scene, so perhaps there were some public statements to this effect that I missed ? You've arrived late! This appears to be a tautology. Nice word tautology, but those who are misinformed are directly bewildered by their lack of knowledge and is at the core of this issue regarding fanciers of the cross. Their understanding, that all dogs are great pets (another tautology), underlies their reasoning and anything of substance pertaining to purity of breed, or historical significance, is swept under the rug and called snobbery! If you don't really care about breed heritage, or genetic consequences, or variability, or basically any of the things a breed fancier holds dear, then ignorance is truly bliss and those that may shatter the bliss are seen as the instigating offender and not the victim. The difference is, again, that GM used and trademarked the name 'Oldsmobile'. The MCOA did not use, or protect the name "American Mastiff'. First off, if the name American Mastiff could have been protected, then why didn't the AMMA people protect it? Apparently, the Panja people, who came after the AMMA people also called their creation the American Mastiff! So perhaps it could not be protected and it's why I continue to state, that it's usage by a group that claims it's greatest percentage of genetics comes from the Mastiff, acted without honor in using that name which did belong to the Mastiff in America for well over 100 years! Shameful & immoral, even if legal! All I have seen from the AMMA is total hypocrisy, just reading Steves quote in 116 says so much for them, it is alright for them to knock off OUR breed but look out if someone tries to knock off theirs. I have never tried to join their forum and have no wish to be involved with them in any way. I dont want to learn about them, I want them to go away. I am not contributing much to this because the whole American Mastiff scenario makes me sick. Fact: They are a crossbred dog, nothing more nothing less. And what is the difference between this and a Cavoodle etc. NONE. Designer breeds, and most are the product of puppy farms raking in big dollars. I do not blame the dogs and hope they all get loving homes as all dogs do deserve. And for Heaven's sake, why should we change the name of our breed, for years we have had Mastiffs. This is the name of the breed and a name I not only respect I love. We are not the ones with the knock off are we. We did not take what they had and change if for the better according to them. A new improved model. But wait, there is more, if your AM does bite someone, dont worry, the Mastiff will probably get the blame. BAH!!! There are no English Mastiffs, there are no Australian Mastiffs, there are no American Mastiffs (as they are NOT A RECOGNISED BREED), there are Mastiffs and now copies. These copies can do us so much harm and I shudder to think of what the future holds for us, we will end up on the BSL list, and it will be through no fault of ours, it will be caused by misrepresentation of our dogs and innocent animals and owners will be held to account for others. Can you imagine them putting their hands up and saying "wait a minute, it was not a Mastiff that bit, it was an American Mastiff". I sure can't. And the general public will only hear Mastiff anyway as they wont know there is any difference. Sure, like others I got the question often, what type of Mastiff, my answer was always the original and the best. If I was asked if my dog was a Bullmastiff I would just say there was no bull about my dogs, they are Mastiffs. With Neo people calling their dogs Italian Mastiffs they are now being confused with Corso's here because some of them use Italian Mastiff, Bordeaux people call their dogs French Mastiffs so it can be confusing to Joe Public when you say Mastiff, but it does not take more than a few minutes to explain to people there is one Mastiff and they have lots of pure cousins and quite a few imitations. We have to protect and cherish this outstanding breed of dog, not sit by and watch it be called a second rate drooly beast to a pretender. Yes, another unbiased, factually supported and unemotional response. Fact: They claim that their cross has less health issues than the Mastiff. Where are the health certs backing this claim???? Fact: They say it looks "almost identical" to the Mastiff. Really????? I can spot one a mile away. Fact: The have stated there is no need for rescue in their breed. Their dogs end up in rescue ALL THE TIME. They have stated they will not take a dog back without proven documentation that it is an AMMA. This is INTENTIONAL as no money can be made from rescue, only spent. Fact: They say they have a COE but none can be found anywhere, IT DOES NOT EXIST. How can you provide proof of something you never had in the first place? Fact: They use false and misleading advertising in the sale of these dogs, they do this knowingly every time they sell a puppy. Fact: Fredericka herself wrote in an old email that she wasn't completely sure of her foundation stock including the possible use of a Great Dane. This is nothing but a Pyramid Scheme of BYB origins raking in serious money and that is their sole purpose. And of course they will not address these questions as they cannot prove the validity of their own claims! As previously mentioned, I think the dogs should have been called The Anatolian Mastiff by the originators. This nomenclature would clearly identify what they are. I would have no problem with the breeders/fanciers comparing them to mastiffs or any other breed as long as the identification is clear. I know none of these people or their motives but it seems the use of the American mastiff name is being used as a sales tool. I have seen no evidence to the contrary. Help me understand how the ' American Mastiff' appellation is being inappropriately/illegally used as a sales tool, IF there is no trademarked use of 'American Mastiff' for our/another breed? However, thank you for participating, as it does suggest more forum members are participating in what they believe in. Well Karen, since you are allowed on their forums, maybe you can ask for proof backing these claims and we can be done with it. I consulted for Ford of Europe for years, assisting teams in producing the concept and design of the Fusion, as well as the Ka. I helped my teams achieve top of their cohort list quality levels, as well as quality awards. This involved a huge struggle against existing culture. Don't even try to tell me about these issues. I know full well and first hand! Please explain your analogy further as it does not make any realistic sense to me. Have you EVER actually told a customer interested in a white car that you had what they wanted, and then produced a black car? Really?! If so, I think you should be fired -- UNLESS you succeeded in convincing them they wanted a black car. How, exactly, does this relate to Mastiffs versus 'American Mastiffs' ? Given the intense emotionalism and hostility on this forum I highly doubt it. However, if anyone can give me questions that are not framed in hostile, accusatory terminology, I would be happy to ask. However, I do not believe for a second that some people on this forum will ever 'be done with it'. Karen, I am biased, I am emotional about this and I stated two FACTS. This is a crossbred dog and it WILL bring harm to our breed. You answer my question, what is the difference between this and every other designer dog out there. NONE. One thing you are right about, I will never be done with it. Nor will I ever be done with trying to see all designer dog breeding stopped. it WILL bring harm to our breed. How so, with existing or projected quantifiables? then why do you feel so threatened by this one? I am also a dog snob and damn proud of it. That is, of course your choice. Just keep in mind, some other snobs see your pieds as , since I do not like to use pejorative words, anomalies who do not meet the standard. I personally believe the pied gene is of ancient origin and pieds should be acknowledged as a 'legitimate' colour, but that is a different argument. I would also also encourage readers to look at the first several posts on this thread. I did not begin this topic, and my initial posts stated empathy with the 'Mastiff' perspective. I have quite a lot of interesting and relevant information I will organise into an integrated framework tomorrow. Right now, I would ask people attacking me -- what is your hoped for outcome? It may be legal, but immoral! That's what makes it inappropriate. As far as other designer breeds are concerned, not every one has campaigned against the founding breeds that went into it's creation! Nor have they adopted the legitimate name used previously by the founding breed! I recently stepped in something that was produced by a designer Cocker-doodle. I believe it was Cocker-doodle doo! Given the intense emotionalism and hostility on this forum I highly doubt it. Never addressing the real concerns the Mastiff community has been stressed over the last few years gives rise to hostilities. So the newest tactic, is to ignore our concerns because of our hostility. Once again, blaming the victim instead of the culprit, which gave rise to these feelings. Governments are toppled when the majority of the populace are left without answers from those in charge. The population becomes increasingly hostile and if the leadership fails to acknowledge the grievances, those in power are removed. Something similar has occurred in this situation, as the Majority of Mastiff fanciers are still waiting for a response from the AMMA community regarding our legitimate concerns. Instead of definitive answers, all we seem to get is indifference and lame excuses. Blaming us for our hostility due to their silence. We are rational & reasonable people, we permit controversial postings on these threads by AMMA folks. In my view, the only reason why no responses are made from the AMMA folks, is that they can't validate their claims, or address & remedy the harm they've caused the Mastiff community! All they need do as a first step and perhaps the only step, is to insert the word Anatolian into the center of their cross breed's present name. The Anatolian was the breed promoted by the group as being the fix for all things Mastiff, so why be ashamed to insert the name into the AMMA? Such an act would show the Mastiff community, that there are reasonable people in the AMMA community, and not just a group of closed minded, self serving, sycophants, who disregard all aspects of the legitimate moral issues raised on this subject by the Mastiff community. Karen, if I were to actually tell a customer that a car is white all the while knowing it is black, then yes I would deserve to be fired. It would be false advertising plain and simple. The AMMA people are doing that very thing, saying all these things about their dogs that aren't true and cannot be backed up with proof. You can't provide results of health testing if the health testing has never been done. You can't say the dogs live longer unless you can graph it on a chart over several generations. You can't say the dogs they produce don't end up in rescue, because they are in rescue all over the internet and in shelters. Saying these things IS LYING AND FALSE ADVERTISING, they should be "fired"! I believe we can, and should create an environment in which people do not fear to be attacked or ridiculed for their beliefs and views. I do not think an environment in which people argue respectfully is 'artificial'.I personally frequently find myself sickened by these exchanges, and if it weren't for my beloved English Mastiff, and my breeder friends who are in the trenches breeding and showing Mastiffs, I would probably select some other breed that did not generate this level of acrimony. I don't know what group therapy you have engaged in, if any, but a T group is far more intrusive than a forum should be. If we truly want broad participation, we should make an effort to ensure it is possible and comfortable for our members. -- and I DO think we should want to hear the opinions of our broader membership!. Not being an active reference does not mean it can be usurped by others to use and capitalize on in it's meaning. Ol' Blue Eyes was Sinatra, Duke/ John Wayne, King/ Elvis, Chairman of the board/ Sinatra, Boss/ Bruce Springsteen,etc. Sure, anyone can use most of those references, but if used in the same industry, by an entertainer doing similar gigs as the original, it would be morally wrong. There are impersonators that use those handles, but they don't hide the fact that they are lesser copies of the original! Can you imagine if someone started singing Sinatra tunes and called himself a better version of the Chairman? He'd be buried next to Hoffa! The point, as I see it, is that Frank Sinatra et al actually publicly USED the sobriquet "Ol' Blue Eyes" and made it their own. WHEN did the MCOA ever USE the term 'American Mastiff"? This appears to be a tautology. Nice word tautology, but those who are misinformed are directly bewildered by their lack of knowledge and is at the core of this issue regarding fanciers of the cross. As I say, tautology, nice word or not. Their understanding, that all dogs are great pets (another tautology) -- I don't believe that is a tautology, but in any case it is inaccurate. 'They' claim that THEIR dogs are great pets, and that is what they are breeding for, not that ALL dogs are great pets. I don't know if this is true or not. If one is a breed fancier to whom breed heritage etc holds dear, than probably one shouldn't consider an AMMA. First off, if the name American Mastiff could have been protected, then why didn't the AMMA people protect it? Apparently, the Panja people, who came after the AMMA people also called their creation the American Mastiff! So perhaps it could not be protected and it's why I continue to state, that it's usage by a group that claims it's greatest percentage of genetics comes from the Mastiff, acted without honor in using that name which did belong to the Mastiff in America for well over 100 years! Shameful & immoral, even if legal! If they didn't or couldn't, then I don't know why. However,if true, in my view this further weakens the claim of the Mastiff organisation for the nomenclature " American Mastiff". And, as I will write tomorrow, there are even more groups using the name "American Mastiff" in various iterations. The American Mastiff , just like a considerable number of other cross-bred enterprises , is , as already told , a designer breed . Reasons to breed such ‘new breeds’ may be multifold . In a world ever changing more quickly there’s always room & zest for novelties . No one can stop this element of life as innovation is inherent to human kind . An innovation needs to be promoted and , as can be ascertained by this thread , the AMMA fancy is quite good thereto . Their arguments favouring their own (designer) breed become even repeated ad multum by the Mastiff fancy , a fancy which cannot refute the claims made by the AMMAs as those claims are subjective upon which only can follow subjective opposition aka the endlessly fruitless 'yes & no game' at worst . So there’s no absolute truth or proof thereto and , in the end , it are the people themselves who has to decide in all freedom whether to purchase a AMMA Mastiff or a Mastiff , to experience if they have made the right choice and to be fully responsible for it . Damage to the Mastiff breed has been done throughout its whole history , mainly by its own fancy (a/o exaggerations all kind) . Damage has been done by the media who erroneously has mentioned ad nauseum a Mastiff responsible for p ex a biting accident whereas in reality it was not a Mastiff but some other species of the Mastiff hue ; there are instances that even a Pitbull-like dog was considered as a Mastiff . Such things happen . The Mastiff fancy should ‘educate’ the community (incl the media) in regard to their breed … but that same fancy is even not able to ‘educate’ their own followers , one only has to look at the stunning diversity , not only in type but also in respective ideas & ideals amongst individual fanciers . A nice approach seems to be – ‘to live and let live’ – not wasting energy on onsoluble collateral damage but to optimalize the efforts in order to elevate the qualities of our own breed in every domain . No Terrier-like backbiting but guarding , an attitude proper to our own dignified breed . Now let's all sing Kumbaya! Look, making erroneous claims has been a tactic used by many counterfeiters to promote their inferior products. In many instances some of those claims cannot be refuted. For example, if I were to breed a line of pedigreed Mastiffs and claim they are superior to other Mastiffs, who's to say otherwise? Remember the Deer Run Free claims? This is an issue of branding and riding the coattails of an established breed. It's also a case of infringement of a non registered name, which moral domain belongs to the Mastiff proper, not some interloper looking to capitalize on an already established ancestry. We could certainly tolerate their existence, had they entered the field with more aplomb and sincerity and without the moniker chosen for their cross . We still might not like their presence, but it would have surely reduced the angst. Difficulty in forming solidarity of views among intra-breed members, pertaining to type within one's own breed, should not abrogate an injustice perpetrated on an entire breed by an outside faction. Historical damages to the breed, should not justify the acceptance of a present damage to the breed. The act of guarding, involves protecting and if necessary defending a zone within your territory. There's no shame in speaking out in defense of an ongoing encroachment, all because legal recourse may be past a statute of limitations. A pebble in a shoe can still be an effective motivator! I have no doubt, that by now, you fully understand that concept. I am really tired of being attacked. It is 1.30 am here and I am sickened and tired. Karen, you are not being attacked. Your views may be under the gun, but I don't believe anyone has attacked you personally. In this heated debate, it may appear that you are in a minority stand in your position and it may feel as though you're being mobbed by the majority. This may in fact be the case, but don't take it personally, as it comes with the territory when you are taking unpopular positions. I've been there on more than one occasion, trust me on that! The outrage regarding the AMMA people’ doings aka ‘the pebble in the shoe’ can only be stopped by abolishing such feelings as they seem to be only counter-productive , ie they only may strenghten the (erroneous) idea of ‘Mastiff fanciers being in defence’ against a REAL threat . The Mastiff breed stands on its own and genuine canine fanciers certainly appreciate its qualities . So what’s the point ? Name hijacking , subjective claims ? And where does it end ? Canadian Mastiff vs the Mastiff fancy in Canada , Mexican Mastiff vs the Mastiff fancy in Mexico , Polar Mastiff vs the Mastiff fancy in Greenland , &c , may be standing as menu on a future dinner table ? If the Mastiff Club of Mexico had an interloper designer breed, calling itself the Mexican Mastiff, I think there might be some hackles raised. Especially if that wanabee group stated it's breed was superior in a number of areas to the genuine article. Name hijacking is a real offense, even if a loophole has diverted legal consequences. The stone in the shoe reference was targeting the opposition, as we can continue to be that stone until they amend their distortions. As to their claim of greater longevity, it might be valid. We know that smaller breeds generally have longer life spans and if the AMMA is a lighter & smaller version of the Mastiff, I would not be surprised if the data showed an increase in longevity. I might add, that smaller Mastiffs would also fall into a longer lifespan statistic, so it's not necessarily breed specific, as much as it is size specific. One can make a case of health testing being much greater in the Mastiff community, compared to the lack of data from the AMMA community in this regard. The net result, can be greater longevity in Mastiffs, through improved genetics, and in reducing ailments that would ordinarily shorten a dog's lifespan. This could reverse the possible longevity edge of a lighter cross, which lacks a majority of breeders who are skilled in selecting the best of the best for breeding better dogs. In your own backyard concerning the Belgian Mastiff, we find a completely different history and no references to superiority over another Mastiff breed. If upon it's implied resurrection, we find it too similar to the Mastiff, or if modern fanciers of the restored version promote the Belgian as an improved type over the Mastiff proper, there would be an expected outcry from the genuine Mastiff community in Belgium. The Nebolish is a dog of great presence, the most agile of the mastiff breeds. It should be of strong muscular structure, large boned and have a wide chest. The head is broad with natural ears, a short, wide snout and a scissor bite. Excessive flews are not desired so there is no slobber problem. The coat is typically a short-medium length, but long coats can occur. Colors include fawn and brindle in all shades, including a rare silver. Markings include a black mask; white markings are permitted, but not desired. The tail may be docked. The Nebolish Mastiff is very even tempered, alert and dignified. It is not an excessive barker. Loyal, easy to train and naturally protective, it can be stubborn if it senses that it is stronger minded than its handler. His intelligence, loyal affection and fearless courage make him a highly desired companion. An excellent family member, often used as a working dog or livestock protector. Good natured, patient and playful with children. Mastiffs require training and strong firm leadership skills, and are not recommended for the first time dog owner. The objective in training this dog is to achieve pack leader status. It is a natural instinct for a dog to have an order in its pack. When we humans live with dogs, we become their pack. The entire pack cooperates under a single leader. Lines are clearly defined and rules are set. Because a dog communicates his displeasure with growling and eventually biting, all other humans MUST be higher up in the order than the dog. The humans must be the ones making the decisions, not the dogs. That is the only way your relationship with your dog can be a complete success. Males and females should reach over 100 pounds and have very solid muscular structure, the focus being a dog that is sound and works with agility, even at a mature age. No breed is free from health ailments; there have been none that the Nebolish are predisposed to. The Nebolish was developed to be a large, agile dog, free of genetic defects. 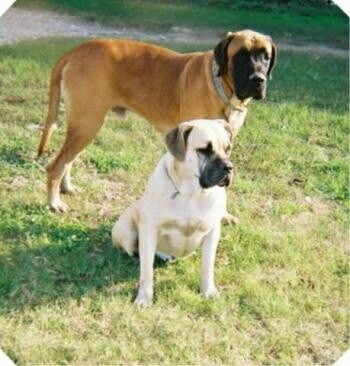 Breeding of Mastiffs is not recommended for the novice; there are many breeding problems with Mastiffs. It is recommended to spay or neuter to ensure a longer lifespan. The Nebolish Mastiff is not for the apartment dweller. It can get by on a daily walk and a large yard, but enjoys acreage to explore. Not prone to roam, but must be contained because of the intimidation of his size! Once boundaries are established, the Nebolish will stay in a 4-ft. or stock fence with no problem. The Nebolish was developed in Canada very cold climate, spending winters in front of the fireplace. This breed thrives in warm climates, loving the sun and water. The Nebolish Mastiff needs room to run, and loves to swim and hike. The adult Nebolish is at home living indoors, but needs a daily walk! While out on the walk the dog must be made to heel beside or behind the person holding the lead, as in a dog's mind the leader leads the way, and that leader needs to be the human. These dogs love to check the pastures with their owners; they will make certain all fences are secure and free of intruders! Very minimal, a brisk brush, occasional bath; the Nebolish love water! With over 80 mastiff types, the Nebolish is one of the rarest. It was developed in late 1960s in the Northwest and Canada. The breed was developed to increase the agility, health and life expectancy of the mastiff by crossing Old English, Bull, Dogue de Bordeaux, mastiffs, and it is suspected that the Great Dane, Boxer and Saint Bernard maybe in the bloodline. There has never been an exact breakdown of the breeding program; to keep the line pure the exact breedings that evolved to the Nebolish we know today has never been disclosed. The Nebolish ancestry can be traced back to Aristotle and Alexander the Great, who received these large dogs for soldiers’ protection from lions. The Noble Loyal Healthy Mastiff is not a new breed, but a breed which was lost in history and now rediscovered in the Nebolish Mastiff. Others say it was developed in Canada in the 1960s, by crossing the Neapolitan Mastiff, Dogue de Bordeaux, English Mastiff, Boxer, Bullterrier, Bullmastiff, Deutsche Dogge, and the Saint Bernard. While others claim the Nebolish Mastiff is simply a cross between the German Boxer and the French Bullmastiff. Others report the Nebolish Mastiff is a breed still in the stages of development and some even claim it to be a mix. 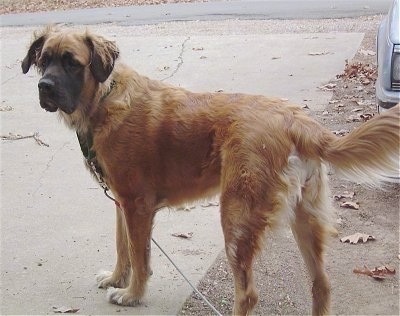 Photos posted of Charlie (long coat - see below and Photos Page 1) could be the Saint Bernard in the lines coming out, but this is unclear. The CKC (Continental Kennel Club) recognizes the English Mastiff and Neapolitan Mastiff cross as a Nebolish Mastiff. To date, we have only come across one breeder of the Nebolish Mastiff. 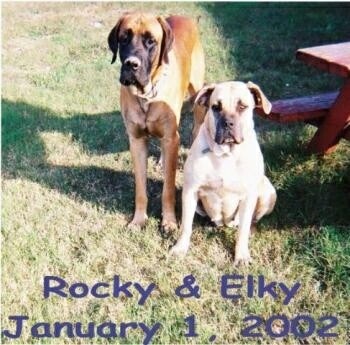 Female Nebolish Mastiff sisters Junotoo and Coper of Whiteface Ranch, photo at 2 years old. Tails may be natural or docked in the Nebolish breed. Maxy the Nebolish Mastiff at 5 months old and weighing 50 pounds—"She is the smartest dog I have ever owned! She was purchased from the local pet shop. She was the only one in the litter who was white and brindle. The rest were all brindle or a light tan." Corn in Dog Food. Really? The Material contained herein may not be reproduced without the prior written approval of the author. Contents & Graphics Copyright © Dog Breed Info Center® (C) 1998- 2013 . All Rights Reserved. Our work is not Public Domain. In the above posting, we see the so called Nebolish Mastiff, which for all intents & purposes has a dryer mouth and a similar unknown heritage as in the AMMA, save the Anatolian cross. Supposedly, the Nebolish was created in the early 60's, yet the Mastiff community has never once reflected, or negatively targeted the breed, or felt threatened by it's presence. Then again, the Nebolish did not claim AMERICAN MASTIFF as it's formal name! Branding does make a difference, as my good friend Dr. Phil Nulman will validate. I believe this clearly demonstrates the angst created by the AMMA groups, as the American Mastiff name gave a heightened sense of credibility to the Anatolian cross, which did not exist in the Nebolish Mastiff. Essentially, the alleged reason for the creation of the AMMA was to create a dryer mouth, etc., but the Nebolish already existed and laid claim to the same dry mouth. Therefore, why experiment with another designer Mastiff in the creation of the AMMA? It's popularity is based on the Mastiff's popularity, since the names are so similar, similar photo representations to the unaided eye, and the erroneous claims made to enhance the appeal to clueless others. $$$$$$$$$$$$ is at the core of all such improved Mastiff types and grand rationalizations used to validate all things AMMA. Most erroneous AMMA claims are just threads used in weaving the emperors clothes! The American Mastiff Family.net mentions a/o – ‘American Mastiffs tend to drool less than their English Mastiff cousins , have a lower incidence of health problems (they are not completely immune to giant breed health issues) and tend to have a longer lifespan .’ This sounds quite fair rather than offending . The AMMA family doesn’t mention the Mastiff but the English Mastiff whereas the list of dog breeds registered by the CKC (Continental Kennel Club) mentions ‘the Old English Mastiff’ (so not ‘the Mastiff’) , perhaps also in order to clear the air from overlaps . Edit - The AMMA justification lies in the fact that their Mastiff is developed in America whereas their cousin the Mastiff is developed in England and therefore called the (old) English Mastiff . Sounds reasonable , isn't it ? All of those claims unsubstantiated. The AMMA claims seem to be of a non-absolute nature , iow they leave room for interpretation - p ex some American Mastiffs may drool less , some others may drool as much as their English cousin , &c . And therefore not a black vs white statement which cries for being substantiated . Karen, with respect and no attack on you in anyway, the pied debate has nothing to do with this, but to clarify a point, I got my pied because I was finished with breeding and showing, I purchased him simply as a companion, I believe in the standard, he did not conform to the standard, he was neutered. I know others are trying to have this colour recognised and I really hope they succeed, but I cannot see it happening in my lifetime. But, even though Dozer was not up to the standard of a Mastiff, I actually have his limited registration papers and under breed it says, "Mastiff". He was 100% mastiff, just the wrong colour, he was not an imitation. As far as new breeds go, I could certainly support a Pied Mastiff designate, to validate the re-emergence of Pied Mastiffs. Provided that that are kept as a separate class, either within the breed, or as a separate individual variety of Mastiff. More of a rationalization than a justification. You take a breed from Turkey and cross it to a breed from England and then call it .....American?????????? I'll take a Belgian Shepherd and cross it to a German Shepherd, then call it an American Shepherd ? In Canada it becomes a Canadian Shepherd? When Mastiff breeders in America breed two Mastiffs, will the get still be Mastiffs, or are they now a new breed called American Mastiffs and no longer to be called Mastiffs? All because a cross is done in America, an American label is not a given, nor should it be, especially when the American Mastiff name was used to describe the Mastiff in America! Semantics aside, it's just wrong to promote a breed the way they have and expect silence from the victims of their actions. Read from the original founding source! THE AMERICAN MASTIFF looks identical to the English mastiff in color, shape, size, etc. however, they have a much dryer mouth due to out-crossing early on in the history of the breed. Does this leave room for interpretation? Shouldn't claims such as these be substantiated? Are you defending an interloper who rewords our standard and tries to market their cross as an IDENTICAL copy of the Mastiff? Are you a fan of counterfeit goods? If not, why defend such practices, especially coming from the founder of the breed! Their sole claim to fame has been the naming of their cross an AMERICAN MASTIFF and marketing the cross as an identical replica of the true Mastiff, but with a dry mouth. Nice PR campaign and they're getting away with it, due in large part to clueless fanciers! First, thank you for a respectful answer, and -- as I have read the Pied threads, I understand your position vis-a-vis your pieds. I, too hope the colour is eventually recognised. My point, however, is that people attacked your pieds in a way that I would describe as prejudiced snobbery, and I am sorry to see you join them in terms of AMMAS -- whose organisation absolutely agree are cross-breds.would have more sympathy for the idea that AMMAS are 'imitation' mastiffs if they had not acknowledged that. IF we look at the first standard proposed by Wynn, would we not see a number of significant differences in the breed standards from then until now? Michele Parlier has stated that the AM standard is in a process of evolution. Most sites I have found,relating to the AM -- or AMMA in your parlance -- have included the moderate terminology Marcel has cited. WE do not have a breeders' council (who imo profess the most extreme views), hence we have no ideas as to the difficulty of managing/moderating such a group. More non-answers. Where is the information you promised us last night? Thank you SO MUCH for your contributions which mirror my perceptions and feelings on the topic! Ok, I have been having issues with my computer today – in which, when I complete my comment and add ‘reply’, it disappears. Hence I am not sure where to jump in. Kristy,I have been impeded in responding to your question, by the above as well as business demands and the unexpected requirement to take care of my 8 mth old Grandson for 8 hours today. I am sorry, but my priorities are Grandson trumps forum issues, in terms of importance. Get as nasty as you like, it will not change my priorities. I will try to answer your questions in time.